Back in 2013, I had the incredible honor of being a finalist in the one and only Pillsbury Bake-Off. Have you ever heard of it? I remember seeing it on tv many years ago and decided then and there that I just had to be a part of this historic event! It might sound corny, but dreams really do come true. The Pillsbury Bake-Off started back in 1949 at the Waldorf Astoria Hotel and for many years the grand prize was $50,000. In 1994, they increased the prize to $1,000,000. Tens of thousands of bakers submit their recipes for each bake-off and 100 finalists are chosen to compete in the contest. The first year I competed, the bake-off was held at the Aria Grande Hotel in Las Vegas. 100 tiny little kitchens were set up in a big banquet room. When the competition started at around 9 am, we had 3 1/2 hours to prepare our recipe for the judges. 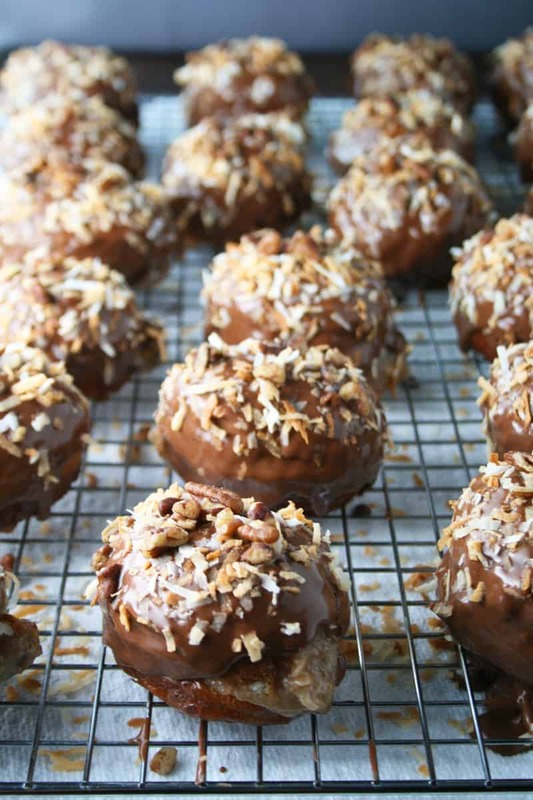 German Chocolate Donuts was my entry in the 46th Pillsbury Bake-Off. 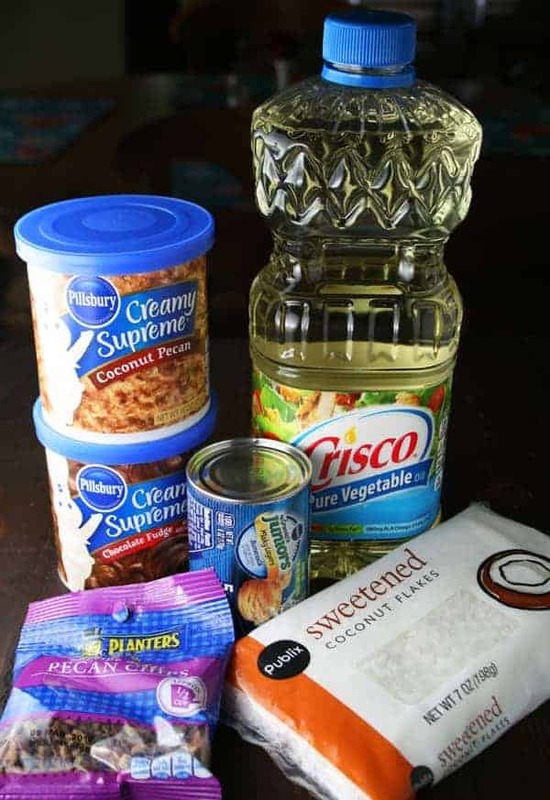 Each recipe in the contest could only use seven ingredients or less and you had to use at least two ingredients from their list of products. I haven’t made this recipe in awhile and I also haven’t shared the recipe with you on my blog yet, so I thought it was about time that I did that. 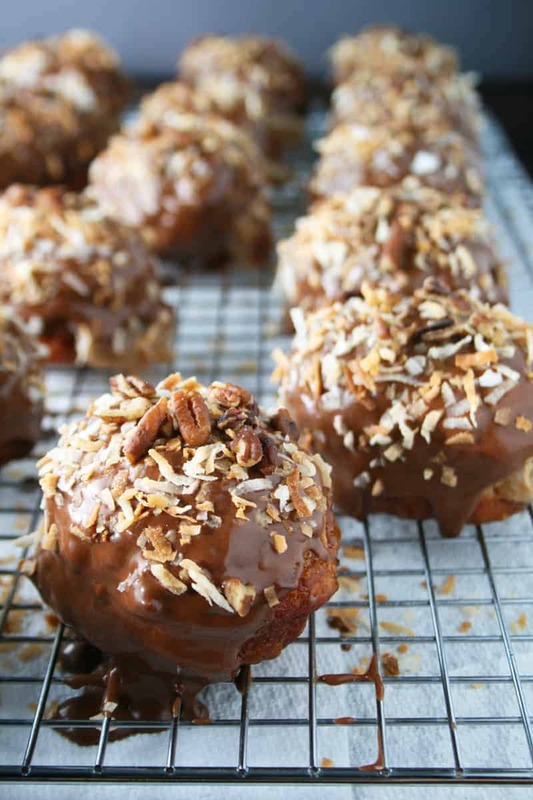 You can find my original recipe for German Chocolate Donuts on the Pillsbury website. But today I’m sharing a slightly altered version of the original. I was signed up to bring pastries to my bible study sharing day and needed more than 8 donuts which is how many the original recipe makes. The original version uses the Pillsbury Grands Biscuits which are quite large. 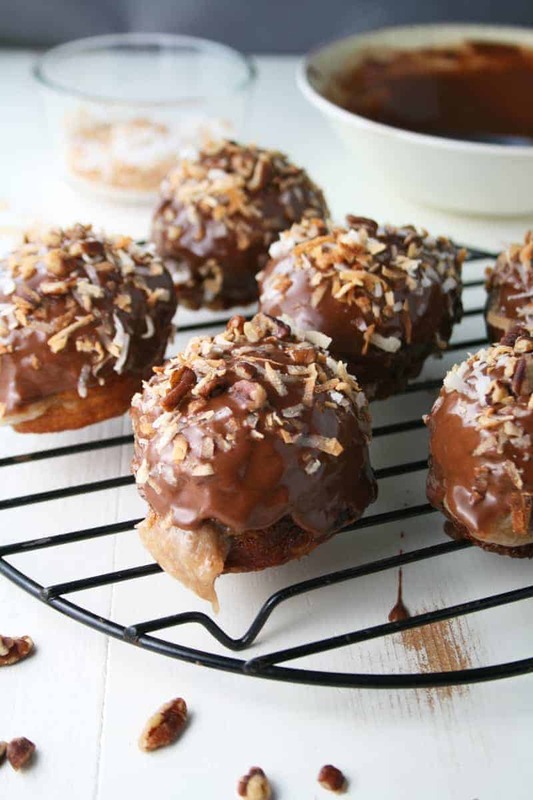 This time I used the Pillsbury Grands Jr. Biscuits which are quite a bit smaller, so instead of making 8 big donuts, this recipe makes 20 smaller donuts. 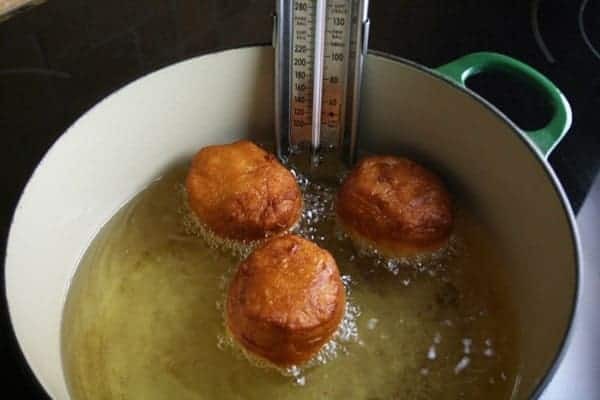 Start by frying the biscuits in the oil which has been heated to 350°F in a heavy saucepan. Let them fry for about a minute on each side. Don’t let them get too brown. Let them cool on a cooling racking with paper towels underneath. 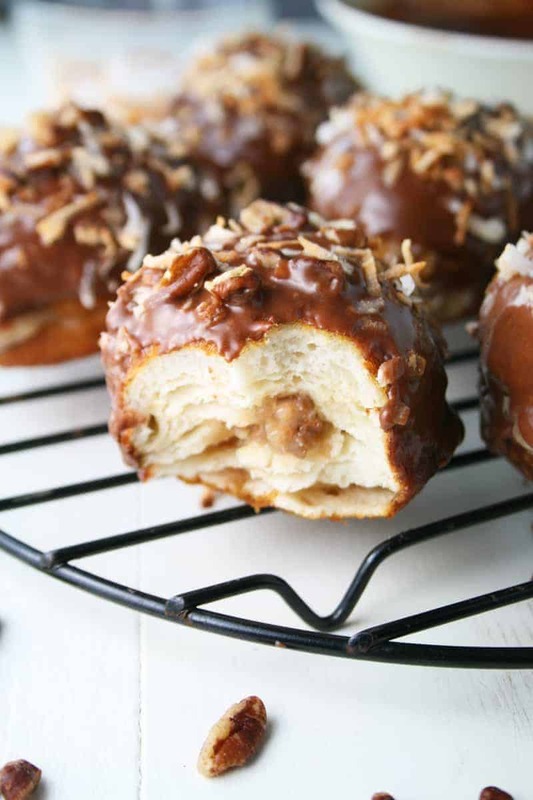 Fill a pastry bag (fitted with a 4B pastry tip) with the coconut pecan frosting. Take a knife and poke a hole in the side of each biscuit which we will now call a donut, then squeeze the frosting into the center. Keep squeezing until it’s full and some of the frosting starts to come out of the hole. Meanwhile measure out 1 cup of chocolate frosting in a medium sized bowl. Stir in 2 tablespoons water or a little more if it’s too thick. 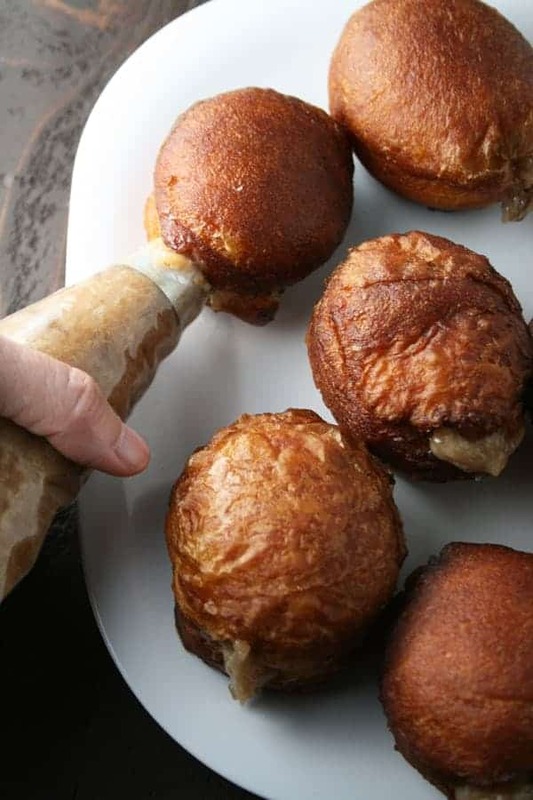 You want it to be the consistency of a glaze. 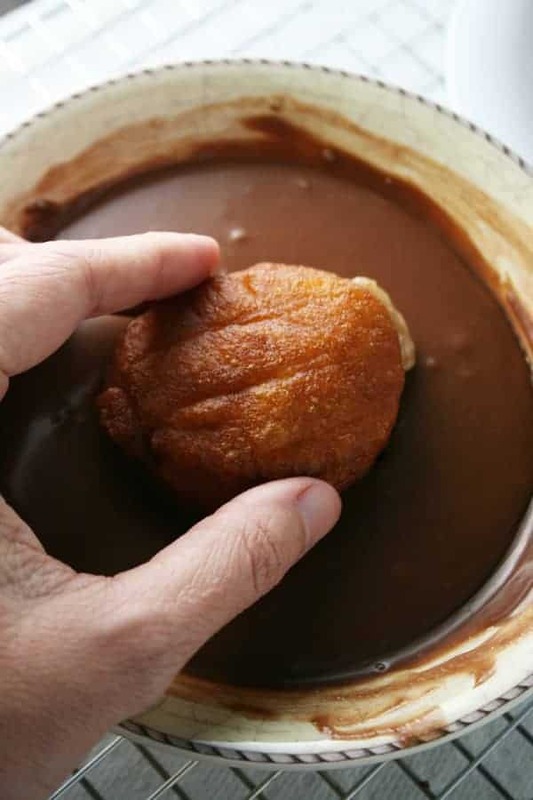 Dip each donut into the chocolate glaze. Make sure the donut is completely covered in chocolate on one side. 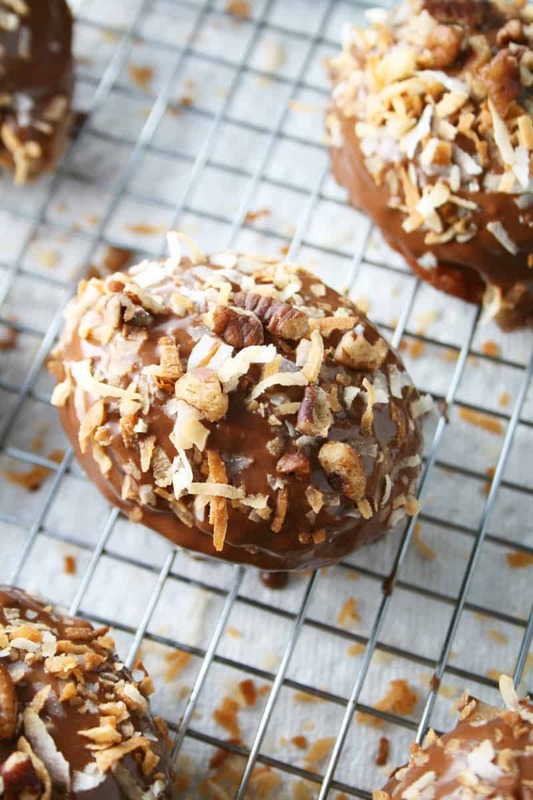 Sprinkle a mixture of toasted coconut and chopped pecans on top. I brought these donuts to my bible study last week and they were a big hit. 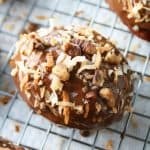 German Chocolate Donuts are such a delicious treat! Enjoy! p.s. Do you have any Pillsbury Bake-Off experiences? If so, I’d love to hear about it in the comments below. Also, in 2014 I made every single grand prize winning recipe from the bake-off which as of now is 52 to recipes. Click here to see what I made. In 3-quart heavy saucepan, heat oil over medium heat to 350°F. Meanwhile, spoon coconut pecan frosting into a pastry bag fitted with a 4B pastry tip. Set aside. 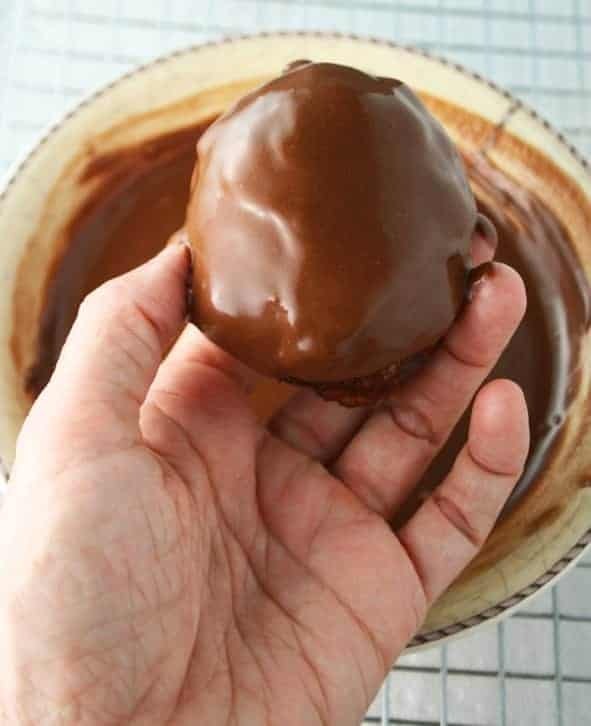 In medium bowl, stir chocolate frosting and 2 tablespoons water until smooth. Add a few more drops of water if it's too thick. Set aside. Place paper towels under cooling rack. Separate dough into 20 biscuits; gently place 5 biscuits at a time in hot oil. Cook about 1 minute or until golden brown. Using tongs, gently turn over; cook 1 minute or until golden brown. Remove to cooling rack; cool 2 minutes. Meanwhile, in small bowl, mix pecans and coconut. To fill the biscuits which we will now call donuts, use a sharp knife to poke a hole in the side of each donut, then insert pastry tip into side of each donut. Squeeze coconut pecan frosting into center until filled. Dip one side of each donut in chocolate glaze. Sprinkle with pecan mixture. Serve warm or cool.